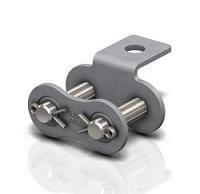 For smooth attachment chain operation, Tsubaki should be your first choice. Our durable attachment chain solutions are totally customisable, with more than 1,300 attachments available for specification. Our Single Pitch and Double Pitch chains are designed with the utmost power transmission precision in mind - which makes them highly resistant to wear and elongation. We even offer a maintenance free Lambda chain for use in applications where re-lubrication is not desired nor possible or where contamination may occur. Tsubaki's pioneering Match and Tag service is unique to Tsubaki and guarantees accurate chain lengths down to a fraction of a millimeter. Chains are therefore properly synchronized, providing consistent performance. 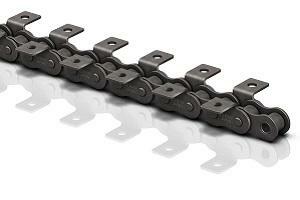 For common applications, Tsubaki can provide you with an outstanding range of Attachment Chain. The chain is manufactured according to the appropriate European Standards. Tsubaki has a wide lineup of lube-free attachment chain, long life products that help customers reduce costs. Neptune™ Chain is a Tsubaki chain that has undergone a special surface treatment process in order to provide the maximum protection from the operating or environmental conditions. Tsubaki's specially designed and tested PC Engineering Plastic Combination Attachment chains will outlast your current chains and contribute to a cost effective application. Learn about the Attachment Chain Structure: the three basic dimensions, the basic parts and the assembly parts of Tsubaki Attachment Chain.